Yesterday was a gift. The weather was perfect. Warm and breezy, not humid and hot. Olivia and I played with friends at the park all morning. We took a walk eating popscicles and ice cream bars. Then we filled up the wading pool. We spent a half hour or so outside together before our friends came to join us. For half an hour Olivia had her mommy back. Happy and well. I dipped my toes in the pool while she played. 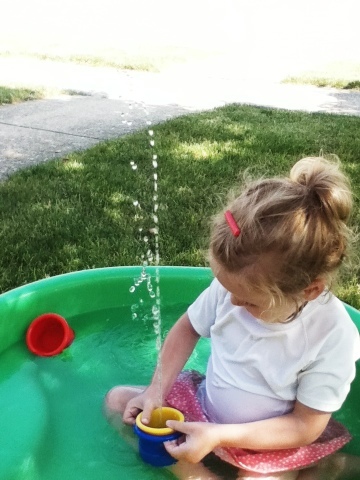 I taught her how to squirt water out of her stacking cups to make a fountain. We played tickle-y octopus. It was a gift. I'm happy, beyond happy--so blessed--to be pregnant with our second child. (Finally!) But I'm sad to say that yesterday was the best I've felt in weeks. The first time in weeks that I got dressed and left the house first thing in the morning. I'll be 9 weeks pregnant on Friday and, suffice it to say, this pregnancy is not proving to be an easy one. Still, I feel so grateful for the tender mercies from The Lord that we've had these past weeks. Helpful, loving friends. The most flexible schedule Bryan's had in 2 years. A calm and patient daughter. An unlimited supply of kid shows and chick flicks from the library. The thoughts and prayers and well-wishes from friends and family. And, especially, an early ultrasound to make sure everything is ok.
After such a happy day yesterday, I started feeling nauseous again in the evening. It turned out to be one of the hardest and most miserable nights of sickness in my life. My throat was raw and swollen from throwing up so much. It was both miserable and scary. I woke up feeling better, though not fully recovered. I slept for hours. Later Bryan took me to the doctor to get some new meds to try. We're all hopeful that things will get better. The night I posted on Instagram and Facebook that I was pregnant so many of you testified to the Lord's timing in all this. You said what a blessing it is to be finished with writing my book. And I've been grateful and mindful of that blessing too, it's true. But in no way has Heavenly Father's timing in all this been more evident to me than in the way that all of my heartbreak, all of my longing and waiting, prepared me for enduring the sickness I've been experiencing on this sweet baby's behalf. How could I pray for something so long and so hard and then complain about feeling sick? All that waiting taught me more than ever that children are a gift from God. That they come in their own appointed time. To know that in the midst of feeling so sick is indeed a tender mercy from the Lord. It is indeed a gift. And it will surprise you what the Lord has done." What a wonderful day. I am thinking of you and keeping your family in my prayers always, and especially with the icky weather forecast. Love you so much - can't wait to see you soon! What a beautiful post my friend. Love you. I'm so sorry that you have been so sick. I so wish we lived closer so we could have Miss Olivia over for a play date all day and she could come and play and take care of our little miss. And you could rest on the couch and we would bring you pretty things that we crafted. I love what you said about how the waiting made you that much more aware of this wonderful blessing, even though you're so sick. My adjustment to motherhood has been harder than I had anticipated and all our waiting and longing is helping me too. And so did this post, I needed it after spending an hour putting our little one down last night. I think this crazy weather is making her not sleep! :) I have to remember that she will only be small for so long and that will be it. Thanks for a reminder friend. I sure love you Katie! I'm so excited to hear about your pregnancy!! Congratulations!! You are in my prayers! Hope you feel better soon! Congratulations. Hope you get feeling better soon. I need to figure out how to squirt water from stacking cups. How cool! Congratulations! I'm so happy for you guys. I wish that I could help and that you weren't feeling so ill. I will keep you and your family in my prayers. I've missed your posts! Congratulations on the pregnancy!!! Praise God! So happy for you, though sorry you've been so sick. I am pregnant with my first- due a month before you! You should come to Listen to Your Mother and just read this, it's just the right kind of thing. We are so excited for your little family growing bigger! Hugs and anti-nausea prayers sending your way and up!